The Christmas holiday is my favorite time of year. Though the days are usually long and hectic, at night our home becomes a haven of comfort against the crowds. Soft scented candles and twinkling lights decorate our living and family rooms and make the evenings cozy, especially when I find a sappy holiday movie on TV. For some reason, I’ve finished all my shopping early this year, so I even have time to bake at night, adding the sweet smell of toasted almond cookies to the holiday atmosphere. This idyllic scene does not happen every year. I’m taking full advantage of the serenity. I mentioned in earlier posts that I’m rewriting my historical romance novels and one of the major changes I’m making is the time period. Originally written for a Regency setting, I’ve since decided my characters are better suited for the Victorian period of British history. So many innovations came into play during the Victorian era, I felt my Gypsy characters hindered by the rigors of Regency mores. They now enjoy the modicum of freedom the 1850’s offer. This includes the renewed celebrations of Christmas. Although Christ’s Nativity has been celebrated since the 4th century, many of the English customs we are familiar with today are only as recent as the mid-19th century. Many early ceremonies find their roots in pagan beliefs, and some customs, like wassailing, still survive. 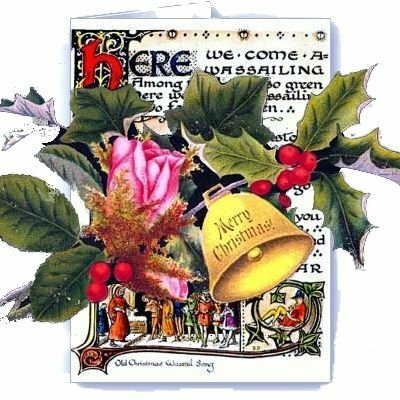 Carols such as “We Wish You a Merry Christmas” and “Here We Come a Wassailing”– dating back to sixteenth century England — were sung as peasants went door to door during the Yuletide season. In the spirit of English tradition, wealthy people of the community gave Christmas treats such as “figgy pudding” to the carolers on Christmas Eve. There is also the Orchard-Visiting Wassailing. The western counties of England such as Devon, Somerset, Dorset, Gloucestershire and Herefordshire are particularly known for their cider-producing orchards. In this region, wassailing refers to drinking and singing to the health of trees, encouraging them to thrive and produce fruitful harvests. Customs changed radically when the Protestant Reformation hit the scene. Pagan customs were condemned as superstitious and public celebrations of Christmas were banned. The Puritans abolished all celebrations. Excitement and joy in the holiday declined even into the Georgian Era. It wasn’t until Prince Albert married Queen Victoria and brought many German customs with him that Christmas began to gain popularity again. During this holiday season I’d like to share my research of the reawakening of the beautiful customs of Christmas. We owe thanks to the Victorian Era for many innovations and discoverings, but I’m most thankful for the return of Christmas celebrations! This entry was posted in Christmas, Christmas carols, Victorian England, Wassailing. Bookmark the permalink. I’m loving these bits of history, how fun and that you can tie them into the era of your book. It’s been fun researching. I’m searching for facts to share all month. Come back soon, Leslie! !